embedded the entire film from You Tube, I have just chopped off the relevant portions from my father’s films. Coming back to the post, last time I talked about the prank my father played on Jeetendra ( that goes into the trivia section), he did it while shooting on location in Hyderabad for Bikhre Moti. As I was watching some portions of Bikhre Moti on You Tube, it triggered a chain of thoughts. It set me thinking, back in the late sixties and early seventies there were several films which had the potential of becoming box-office hits, but bad scripts, indifferent direction and terrible dialogues led to these films ending up as damp squibs. Bikhre Moti was one such film. In fact, writers like Salim-Javed later on used similar story lines to create box-office bonanazas with there hard hitting dialogues and tight scripts. Bikhre Moti starring the hit pair of Jeetendra- Babita had the not so unusual story of two brothers Anand (Jeetendra) and Gopi (Sujit Kumar) getting separated in their childhood. While Anand grows up to be an inspector, Gopi ends up as a criminal.Their parents played by my father and Kamini Kaushal have their own misery. My father asking his screen wife Kamini Kaushal to give him her mangalsutra, so that she can pretend to be a widow instead of a murderer's wife. While the father is serving time in prison having committed murder due to some unfortunate circumstances, the mother, who pretends to be a widow and is separated from both her sons, becomes the guardian of a rich child who (Babita) later falls in love with Anand. Several twists and turns later the father having served his sentence joins up with his criminal son- of course, he doesn’t know Gopi is his son. In the meanwhile the mother realizes that Gopi is her son and the father is happy to discover that Anand is his son. The film had some terrible dialogues, some of the sentences were quite disjointed,making it that much more difficult for the actors to deliver their dialogues, my father, I remember did have a tough time . Besides that, it had a very, very unbearable comedy track. You will have an idea of how melodramatic the film was when you watch the clip below, just watch out for the dialogues. I always felt it was a pity that the film turned out the way it did, for my father had a really good role in this one. 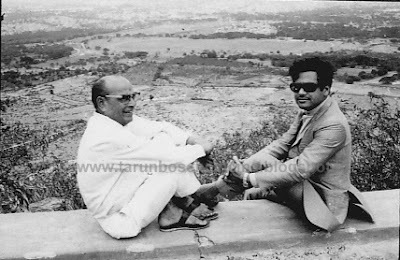 In the clip below you also get to see the unspoilt beauty of the famous Banjara Hills of Hyderabad, I doubt whether it is still the same given all the development that I have heard is happening around that place. In fact the the redeeming feature of this scene is its location. I also like my father's expression in this scene (see clip below), the slight mocking smile, a man caught in the web of fate. My father with Rajesh Khanna, Asha Parekh and Nirupa Roy. who is charged with murder, in the court of law. What my father liked about his character was that it was that of a very jovial person, with a sense of humour. I have mentioned before in one of my earlier posts that, my father never liked to take on any mannerisms, he also did not like to constantly repeat a dialogue, but in this film he had to say, 'Something Something' a few times. Much to our surprise this dialogue proved to be a hit with the audience, so much so that people started repeating this dialogue every time they saw my father. We saw people pointing to our building and saying, “ Pata hai 'something something' idhar rehta hai” (you know 'something something' lives here). Here is a clip from the film. I have picked up the scene where he is seen teasing his daughter about the man in her life, by using the words "Something Something". I was debating in my mind, should I talk about this film or not. Then I thought, I should make a mention of this film, mainly because you see my father in a totally different role. You have seen him as a murderer, a scientist, doctor, lawyer, a rich man, poor man, young man, old man, but I am sure you do not remember seeing him in the role of a domestic help, or someone doing menial jobs, PKP was one such film. In this film he played the role of a gardener (maali). As I had mentioned in my previous post, this was Yogita Bali's and Vinod Mehra’s first film as hero and heroine. My father played Yogita’s elder brother. When my father first saw her on the sets, he did not recognize her, although they had worked together in Choti Si Mulaqat. She had to remind him that she was the same Pinky now all grown up. (From Left) Suresh, Vinod Mehra, Jagdeep, an actor whom I am unable to identify, my father and Pran. PKP was a suspense film, it had its moments, more or less entertaining, I do remember (I saw it a very long time back) I was unable to pinpoint the culprit. The end was a nice surprise. There were some negatives, at least they were to me, as for instance there were some over the top scenes, but that I think is a staple of our masala maar ke Hindi films. I liked Vinod Mehra, he was a fresh face and his performance was absolutely natural. I have picked out three scenes from the film, of course featuring my father.Two of them quite interesting featuring my father, Raj Mehra and Vinod Mehra. Incidentally my father made conscious efforts to stoop a bit in this film, after all he was playing a gardener, so he wanted to portray the subservient attitude of the gardener (see the clips below). 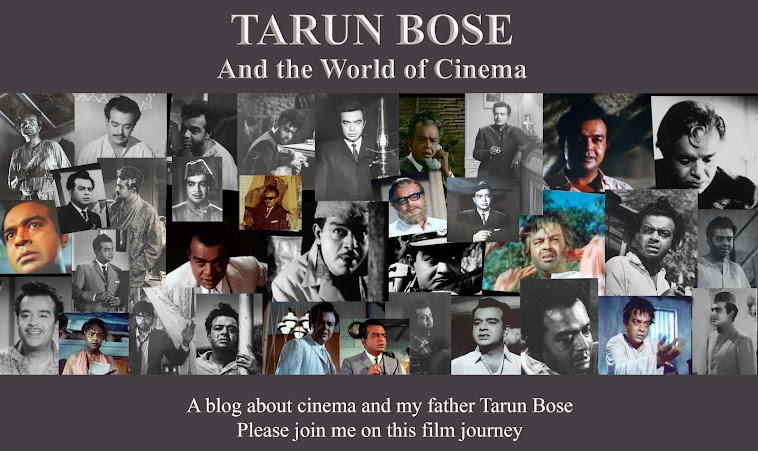 In the clips below you will see a very different Tarun Bose. His acting, posture, gait, get-up, everything is different. Although the thumbnail images you see below are the same they are two different scenes. From the clip below you will get an idea of what you cn expect from the film. 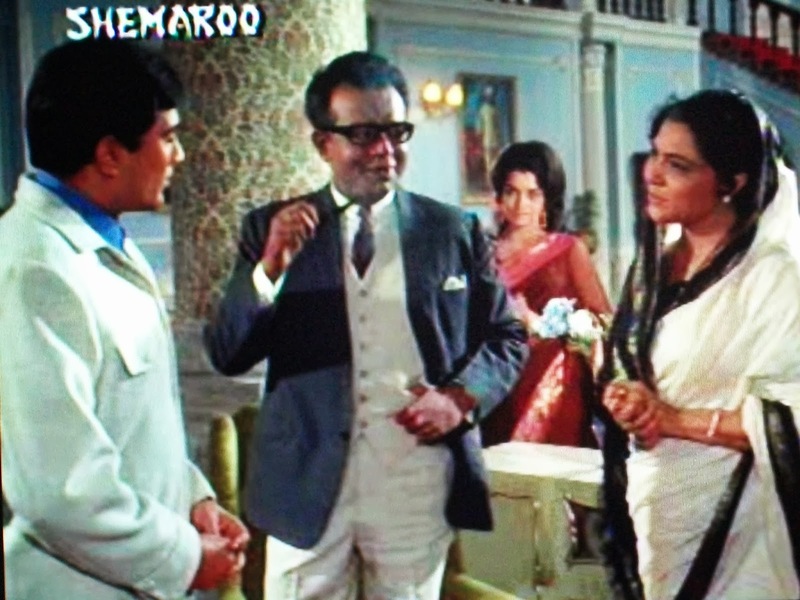 Finally a dramatic scene featuring Pran, Suresh,Jagdeep, my father and a slightly plump Yogita Bali. As you watch the film you get the feeling that my father is the actual culprit but then the end is of course not that obvious. I did talk about the prank my father played on Jeetendra. If you remember I had mentioned in my last post that the four of us had gone out for dinner to this restaurant in Hyderabad, where a rather fat lady was singing songs. Fed up of the loud singing, my parents decided to cut short the dinner and return to the hotel. After this my father again had to shoot in Hyderabad for Bikhre Moti. While on location there, my father very innocently and with a straight face recommended this restaurant to Jeetendra, he told Jeetendra that the food is excellent, my father wasn’t lying about that fact, the only thing he failed to mention was the presence of the singer. Jeetendra decided to try it out, however when he later met my father again he was flustered, his first reaction was, “ Yeh aapne mujhe kahan bhej diya Dada”. (Where did you send me Dada? Incidentally Dada means elder brother and most Bengalis in the film industry are usually addressed by those younger to them as Dada as a mark of respect). It so happened that the lady immediately recognized Jeetendra, not surprising considering he was quite a poular hero then and she was quite excited and came up to him singing “Jeetendah, Jeetendah……..” Poor Jeetendra was in a spot and had to beat a hasty retreat. Pardey Ke Peechey reminds me of what a comedian Jagdeep was and probably still is in real life too. My brother was a witness to this. Once my mother decided not to accompany my father to the Filmfare Awards function and my brother accompanied him instead. As I was underage (the invitations those days specified an age limit) I was not allowed to attend the function. Just as the Shrine Auditorium was the venue for the Oscars for a number of years, back then Bombay’s Shanmukhananda Hall was the venue for the Filmfare Awards function. The awards function was conducted in quite a different manner, the award winners were announced before the function. The entertainment programmes used to be really nice. Nowadays entertainment is all about the stars dancing to different songs. I, for one, find it quite irritating, considering it is what you also see on screen. Those days, the singers like Lata, Rafi, Kishore, Mukesh sang their award winning songs on stage accompanied by a live orchestra conducted by the award winning music directors (click here for a glimpse of one such Filmfare Awards function). Classical dancers like Vyjantimala and Hema Malini performed classical dances and some of the actors performed interesting skits, for instance in this particular function Deven Verma performed a skit along with some other actors. After the function as my father and brother were making their way out of the auditorium they met Jagdeep, he was in a spot, he had some problem with his car, so he took a ride in our car. My brother and father had the most entertaining journey of their lives. He narrated incidents with a dead pan expression and absolute seriousness, but my brother recalls that these were so funny that dad and my brother just laughed all the way home. I am unable to put down all the incidents here, for the simple reason that while reading you will not find it so funny, it is the manner in which he said it that made it so funny. For instance, he was talking about the ridiculous rents that were frozen in time and along the way, true to his comic nature he went on exaggerating, he pointed to a restaurant and said that the restaurant’s owner paid a measly rent of Rs 4 to the owner of the property. When the owner of the property decided to increase it to Rs. 4.50, the tenant promptly went to court and got it reduced to Rs. 4. My brother and my father couldn’t help but laugh at the absurdity of it all. Obviously he was a comedian off-screen too. 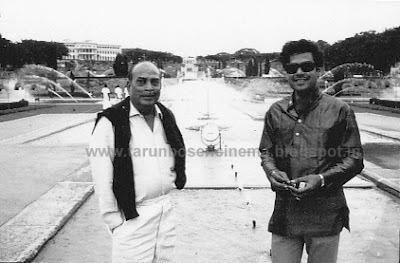 While shooting on location in Mysore for Parde Ke Peechey, my father took his camera along, and below are some of the photographs he took while they were sight-seeing. These I think can be considered rather rare photographs. Unfortunately I could not find the enlarged pictures, I stumbled upon these tiny contact prints. Those were the days of black and white photograpy and contact prints. Thanks to modern technology my brother was able to salvage these photos. You can see (left) Jagdeep and Raj Mehra flanking the statue of Mahisasur after whom Mysore gets its name. (Below right) My father and Jagdeep horsing around like little kids at the same place. 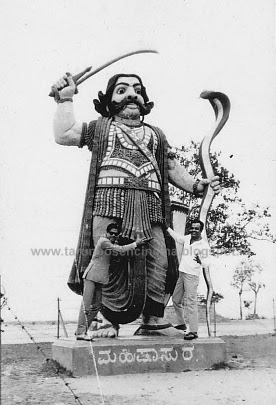 Those days tourists were allowed to stand beside the statue and click photos, later things changed and when we visited the place we saw a fence around the statue. I guess my father shot this picture (left) of Pran and Raj Mehra along with some member of the production team while they were travelling to their location for the shoot and the car broke down. Take a look at our dear villain whom we love to hate, his stance as he is watching the car tyre being changed is so typical of the stance he often took as the villain, only the good natured smiling face doesn’t match the reel villain’s stance. While on Pran I am reminded of another incident, I had narrated this incident in my guest posts on Memsaabstory, but I guess there is no harm in repeating it here once again for the benefit of those who haven’t read my guest posts. 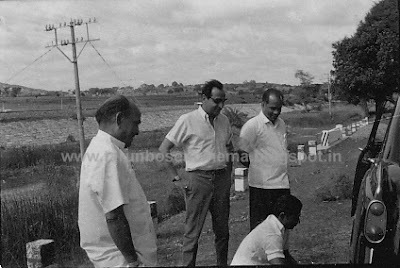 Vyjantimala, Rajendra Kumar and my father. 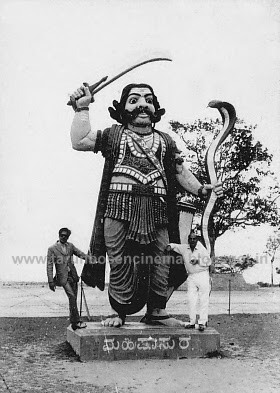 There was a film- Ganwaar- my father acted in it not because he liked the role, he did not, he had to play Rajendra Kumar's father and he was a year older to my father. His incentive was the good pay packet. My father was however all praise for Rajendra Kumar, whom my father described as a thorough gentleman. My father and his colleagues the reel life villains Pran and Jeevan had an encounter with a real life villain, a dacoit, while travelling to the film’s location - a village - somewhere in North India. I think they were picked up from Delhi airport by the production’s car. It was quite late in the night, they were travellng on a lonely stretch of road with forests on either side, when my father heard a tapping sound coming from the car’s roof. My father asked the driver to stop the car so that he could check out what it was, he saw it was the strap of his luggage which had come lose which was tapping against the roof. My father was fixing it when a bearded man riding a bicycle with a gun slung across his shoulders approached them and asked the driver what they were doing there. My father assumed the man was some security guard and was about to explain to him when the impatient man ignoring my father grabbed the driver’s collar, once again repeating his question, this time more roughly. Fortunately at this moment a truck with its headlights on came from the opposite direction, this distracted the man, taking advantage of this, the driver quickly pushed his hand aside and got into the car and started the car, my father, absolutely confused, got into the car too and asked the driver the reason for his behaviour, after all he was just a security guard doing his duty, wasn’t he? The driver told my father he wasn’t a security guard but a dacoit. To think my father was pretty impressed by the authorities for employing security guards on that lonely stretch. The two reel life villains unlike my father had guessed that he was a dacoit but of course they were no help after all they were not villains in real life. With this post I come to the end of my father’s colour films which were released before he passed away, there are many other films that I haven’t touched upon, mainly because I neither have the DVDs nor did I find the films online. I have consciously not discussed Satyakam, for that will go in my last post along with Anupama. I have to do a special post on Hrishikesh Mukherjee, undoubtedly whom one can describe as a master film-maker. In my next post I will briefly dwell on the films that were released after he passed away. Well Anu glad you liked it, yes I would like to continue only my father had a brief stint and so the blog too will have just a few posts. I liked that little anecdote about Jeetendra and that singer. Hehe. Yes Madhu there is no harm in seeing PKP, it is entertaining, yes there are the usual irritants, I do not know whether you had the time to see the chopped clips, but you will see my father in a totally different role, his acting too was quite different. I was quite happy to see him so different when I went through some of the portions of the film. I would have loved to watch the clips, Shilpi, but my net connection is really playing up these days. Right now, I've borrowed my husband's data card and am using that. :-( Hopefully, next week the Airtel people will come and set this right... then I'll watch, if I remember. Yes Madhu if possible have a look, you will really see a different Tarun Bose. I've seen aan milo sajna and liked your father in the film - one of the things you remember afterwards of the film. I haven't seen and like Madhu, hadn't even heard of parde ke peeche But have a mind to watch it, because of the suspense. I love suspense. hahaha Jeetendah...Jeetendah!! Poor Jeetender. Quite naughty of your father I must say. Those pictures of Mysore are great. I'm sure one wouldn't recognoze them as such now. I've seen Brindavan gardens. Thanks a lot Shilpi. Looking forward to the next post. Thanks Pacifist, oh yes my father could be quite naughty when he put his mind to it. Glad you enjoyed it. Thanks for this interesting post, dear Shilpi! So many interesting anecdotes. Loved going through them and reading them. Lack of time didn't allow me to watch the videos, but will surely do it another time. But the video of Bikhre Moti was hilarious in its stupid dialogues. They sound like from a primary school skit with over loud background music. Thank you very, very much Harvey and I am real glad you saw the Bikhre Moti clip, there was no way I could describe it in words, thanks to tube chop I was able to isolate that scene. It is hilarious isn't it? Yes the background music was really jarring. Many people have made this suggestion, problem is publishers are not going to be interested. I have heard a lot of good things about your father, but hadn't seen him in many larger roles until recently, esp. with Aan Milo Sajna--in which he just plain shines. That film underscored his real life sense of humor, I would guess. Every time he walked onscreen in AMS, I was completely engaged--because he seemed like a real person with real feelings, not just the average filmi father template. And he definitely ruled the courtroom scenes!